Mstislaw or Mstislavl (Belarusian: Мсці́слаў, Mscisłaŭ [pronounced [msʲt͡sʲiˈsɫau̯] ( listen)], Russian: Мстиславль [|msʲtʲɪˈslavlʲ], Polish: Mścisław, Lithuanian: Mstislavlis) is a town in Mogilev Region, Eastern Belarus. It serves as the administrative center of Mstsislaw Raion. As of 2009, its population was 10,804. Mstislavl was first mentioned in the Ipatiev Chronicle under 1156. It was initially included within the Principality of Smolensk, but had become the capital of the Principality of Mstislavl by 1180. In the Middle Ages, it was the family seat of Princes Mstislavsky. Pyotr Mstislavets is believed to have been born in Mstislavl. In 1377 it was taken by the Grand Duchy of Lithuania. The first Lithuanian duke of Mstislavl was Karigaila, brother of Jogaila. 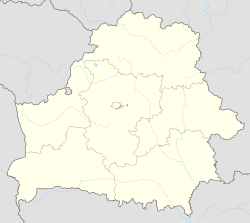 The town remained part of the Polish–Lithuanian Commonwealth in the Mścisław Voivodship until the Partitions of Poland in 1772. Now it is a center of the district. The buildings of historic interest include the Carmelite church (1637, renovated 1746–50) and the Jesuit cathedral (1640, renovated 1730–38, turned into an Orthodox cathedral in 1842). In 1939, there were 2,067 Jews living in Mstislavl which represented almost 20% of the local population. The German army occupied the town in July 1941. In early October, they killed 30 elderly Jews. On October 15, 1941, together with the local police, they murdered from 850 to 1.300 Jews. It is the birthplace of Jewish historian and writer Simon Dubnow, Jewish statesman and Communist politician Yakov Chubin, and expressionist artist Abraham A. Manievich, among others. ^ "Official website of the district" (in Russian). Mstsislaw District. Retrieved 20 February 2015. ^ "Website of Mogilyov Region administration" (in Russian). Mogilyov Obl;ast Administration. 2015. Retrieved 20 February 2015. ^ "YAHAD - IN UNUM". www.yahadmap.org. Retrieved 21 October 2018. Wikimedia Commons has media related to Mscislaŭ. Look up Мсціслаў in Wiktionary, the free dictionary. The murder of the Jews of Mstsislaw during World War II, at Yad Vashem website. This page was last edited on 22 October 2018, at 07:24 (UTC).